Das alleine wird sicherlich um die 2 Jahre dauern. 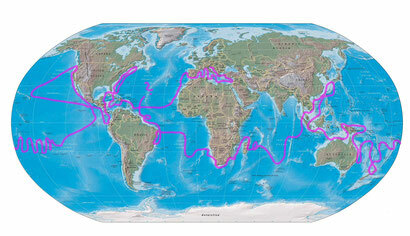 After leaving Europe ... we don't know ... we have places we definitely will sail to ... the only thing we know is: we are going west, because the wind comes from the east (at least in the southern hemisphere and close to the aquator). Diese Route wird im Allgemeinen "Barfußroute" genannt. In der Regel ist ein normales Segelboot 3 Jahre unterwegs. Also einfach mal kurz ein sabatical Jahr nehmen geht sich auch hier nicht wirklich aus. This is the so-calles "Barefoot route". A regular sailing boat would take around 3 years, so it does not fit into the common sabbatical year. So ungefährt könnte unsere Route ausschauen. Wir wissen es ehrlich gesagt gar nicht. Was wir aber wissen ist, wir wollen uns Zeit nehmen um auch die Länder selber zu bereisen und die Länder nicht nur vom Wasser aus anschauen. This could be our route. But to be honest, we don't know yet. What we definitely are planning on: also visiting the countries, not just flying by and seeing them from the water front.